An American Pit Bull Terrier with a heart of gold and a very important mission has taken top honors at the third annual Hero Dog Awards, hosted by animal welfare organization the American Humane Association (AHA) on Saturday, October 5, at the Beverly Hilton Hotel in Los Angeles, Calif. The AHA has been around for more than 130 years, and the organization’s leadership is quite proud to continue the tradition of honoring the nation’s most remarkable canines in 2013. “The American Humane Association Hero Dog Awards were created to honor some of the most extraordinary heroes the world has ever known, the very best of our ‘best friends’ — ordinary dogs who do extraordinary things,” President and CEO of the AHA, Dr. Robin Ganzert, said in a statement. Elle, a Pit Bull and accomplished therapy dog from Roanoke Rapids, N.C., was awarded the title “American Hero Dog” at the 2013 gala, accepting the award alongside her owner and handler, Leah Brewer. Extraordinary Elle has earned accolades for her work teaching dog safety to kids, an important service because more than 2 million children are bitten by dogs every year. She has also helped many people in North Carolina and elsewhere overcome their fear of dogs, gently showering them with affection and showing them it’s okay to pet a dog without being afraid. Recently, Elle and Brewer have started a therapy dog reading program called “Tail Wagging Tales” to help children strengthen their reading skills and boost their confidence. Elle visits kids in elementary schools, and the students take turns reading aloud to the sweet Pittie for 20 minutes at a time. “She provides confidence for students and a comforting ear,” Brewer tells TODAY.com. 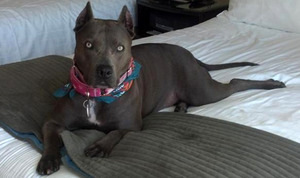 Together, Elle and Brewer educate families about responsible pet ownership and raise awareness about misunderstood dog breeds and breed prejudice. As this year’s “American Hero Dog,” Elle is not only representing her species, but her breed, too. Midvale, Utah’s Cassidy, a three-legged rescue dog rescued from the trash three years ago, was honored in the Emerging Hero Dogs category for his work visiting rehabilitation centers for disabled children. Labrador–Golden Retriever mix (Goldador) Jingles from Amsterdam, N.Y., took the Guide Dog category for the love and companionship he shows his owner Karen Ann, who suffers from multiple disabilities. Bellingham, Wash., rescue dog Lola, who helps her hearing impaired owner Charlene do day-to-day activities, earned the top title in the Hearing Dog category. Retired Locust Grove, Georgia K9 Lakota won the Law Enforcement/Arson Dog category after surviving a devastating car accident and, along with his partner, Officer Travis Fox, helping to change protection laws for police dogs. The Military Dog category award was won by Explosive Detection Dog CWD Carlos, a Military Working Dog who, for five years, protected U.S. troops in Baghdad and Afghanistan before retiring in 2011. After suffering neglect early on in his retirement, CWD Carlos has since been adopted by a loving family in Colorado Springs, Colo., where he continues his work visiting schools despite some challenging medical issues. Search and Rescue dog John D of Little Rock, Arkansas was awarded top dog in the Search and Rescue Dog category for recovering the body of a drowned boy and comforting the boy’s mother in her time of grief. John D also moonlights as a cancer detection dog, sniffing out ovarian and other cancers and helping teach other canines to do the same. And lastly, winner of the Service Dog category, SD Bronx was honored for his work as a seizure alert dog for his 14-year-old owner. “These courageous canines have gone above and beyond the call of duty, saving lives on the battlefield, comforting the ill, aged and afflicted, bringing hope to those who have lost it and reminding us of the powerful, age-old bond between animals and people,” Dr. Ganzert added. Learn more about these hero dogs and more while watching the 2013 Hero Dog Awards, which will be broadcast nationwide on October 30 at 8:00 p.m./7:00 p.m. CST on the Hallmark Channel.